Udupi, April 4, 2015: Briefing media on April 3, Malpe Fishermen Association President Heeriyanna Kidiyur said as per the State government’s announcement, the diesel subsidy would be directly credited to the bank accounts. Malpe Fishermen Association is strongly opposed to the State government’s decision to credit diesel subsidy in the bank accounts. 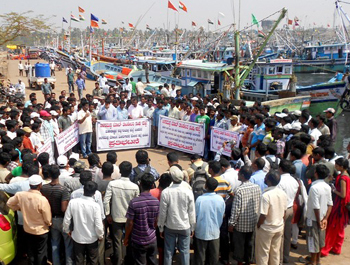 They resorted to the indefinite symbolic strike from April 3 at all fishing ports in the district. The association stand is that it is an injustice to the fisher folks, who are compelled to pay the cost in full on purchase. The consumption of diesel in the fishing boat per day crosses 500-600 litre. However, the government assures tax exemption to only 300 litre per day. The amount that would be credited to the bank account can not be relied upon and irregularities will be the rule. He demanded that the amount be adjusted at the purchase point of purchase as in the past. The fishermen will have to shell out the amount and await the amount credit to the bank accounts. It is absurd, as there is acute shortage of staff in the department and the process would end up in a mess. There is a large percentage of staff shortage in the fisheries department. The present system is prevailing for about 15 years now. The UPA government had announced Rs 3 subsidy per litre of diesel in 2008. But the amount was not released to the fishermen owing to the complications in various procedures to be followed. Earlier the NDA government had announced Rs 1.50 subsidy for the diesel. State government has taken a hasty decision, he alleged. As many as Rs 105 crore is earmarked for various programmes pertaining to the fishermen community in the budget presented recently by the State government. However, the amount is not practicable as the State government has failed to announce any sort of support prices for the fish catch, on the sidelines of the support price offered to the farmers for their growths. He claimed that the government should ensure special packages to the fishermen community who risk their lives. Kidiyur alleged that the MLA Pramodh Madhwaraj had assured that the State government would opt for the earlier method of deducting the subsidy amount when the diesel is purchased from April 1. He demanded that the subsidy be ensured at the point of purchase. The Dakshina Kannada and Udupi Fishermen Federation president Yashpal Suvarna said that the amount of diesel purchased would be recorded in the pass book given to the fishermen. The record statements would reveal all facts avoiding inaccuracy. In Malpe port around 50000 people are directly involved in the fishing business, while another seven lakh people are indirectly dependent on the fishing trade. The occupation has created immense employment opportunities and have ensured income source to unnumbered people. Despite all these unique features, the occupation has been the victim of the government’s lethargic attitude. The fishing business although is carried out only in three districts, it offers bright potentials to States treasury. The indefinite symbolic protest would be held from 9.30 am to 12 noon every day until April 7. If at all the Rajya Sabha MP Oscar Fernandes fails to hold talks with State government to ensure the desire of the fishermen, the Association will take up more rigorous protest in the next phase. A meeting would be held by both district’s fishermen leaders on April 8 to decide over further action.